Slovakia is a landlocked country in Central Europe. With a population of more than 5 million people, it is comprised mostly of ethnic Slovaks. Slovakia is a lush destination with miraculous mountains and ancient castles. Popular attractions include St. Martin’s Cathedral in Bratislava, East Slovak Museum in Košice and the High Tatras National Park near Poprad. Cheap flights to Slovakia are now available for a limited period of time, so prepare to be enchanted by this amazing destination. Bratislava is the home of M. R. Štefánik Airport (BTS), which is a 15-minute drive from the city centre. The Slovak castles will dazzle you with its immense history and tales of lords, kings and aristocrats. 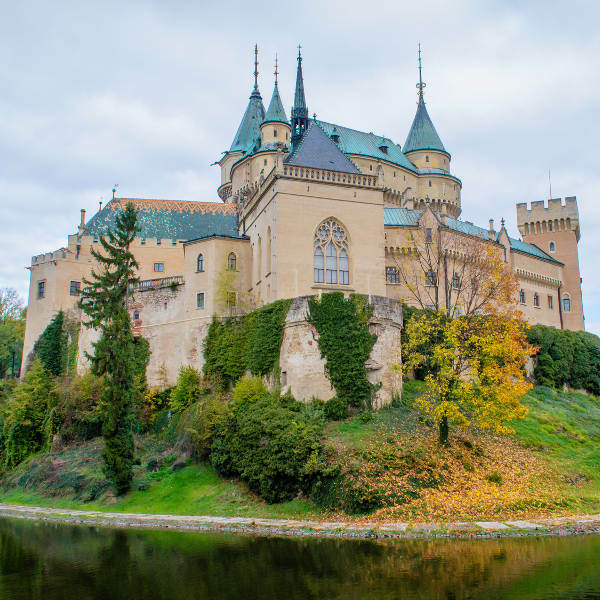 Upon your journey through Slovakia be sure to visit Spiš Castle, Bojnice Castle and Orava Castle. Slovakia thrills tourists in the winter time with its beautiful snow landscapes and abundance of exhilarating winter sports. Adrenaline seekers will have a blast at Tatra Mountains where sensational skiing commences annually. Boasting more than 4000 caves and caverns, amongst those are two caves with spectacular ice formations and a rare aragonite cave. For an amazing experience of the natural wonders to be found, visit Dobšinská Ice Cave and Ochtinská Aragonite cave. Slovakia has a moderate climate with four distinct seasons. Tourists will note that the weather is typically warmer in the plains than in the mountainous areas. Summer (June – late-September) is characterised by extremely hot weather with temperatures exceeding 30 degrees Celsius. July is known to be the hottest month with temperatures averaging between 37 degrees Celsius and 40 degrees Celsius, especially in Komárno, Hurbanovo or Stúrovo. Heatwaves can occur in lowlands. The temperatures in the mountain areas are around 25 degrees Celsius or lower. Winter (December – mid-March) welcomes rainfall and snow to the Slovakian lands. December and January are the coldest months of the year. Of course, winter is the perfect time to take advantage of the mountainous regions in Slovakia, it is best for skiing, dog sleighing or snowboarding. May to September is the peak season in Slovakia, as tourists delight in the warmer sun-filled days in the cities and towns. For cheap flights to Slovakia visit in the months of April and October, you should note that these are the chilly months and some attractions might be closed. However, it is ideal for those who wish to see Slovakia in its autumn and winter splendour. Slovakia’s fairytale landscapes transport you to a land where all things feel possible. Castles and beautiful mountains elegantly make up the aesthetic of this central European destination. This off-the-beaten path country will reward you with magical sights that are sure to have you mesmerised forever. Nature exudes throughout the country, it is quite a vivid spectacle to witness. At least 9 national parks and 14 protected landscape areas can be found in this nature-filled destination. Located in East Slovakia, Slovak Paradise National Park is the incredible chance to explore mind bending underground caves and diverse fauna and flora. Bratislava, the capital city, is the country’s most visited city, it is not hard to imagine why, with its sensational cityscape and its ability to transport you to previous centuries. A trip to the capital city will reward you with emerald landscapes and the incredible opportunity to see the Bratislava Castle. Be sure to see popular attractions such as Primate’s Palace, Blue Church of St. Elisabeth and Apollo Bridge. Located at the foot of the Majestic High Tatra Mountains lies the city of Poprad. The city is renowned for its mountain tourism, this economic and cultural centre will deliver the most exquisite travel experiences. For outdoor enthusiasts, there are several hiking and walking trails to explore. Spellbinding nature triumphs in this sensational region. Compare several airlines and book your cheap flights to Slovakia online at Travelstart! You should be up-to-date with all routine vaccines before jetting off to Slovakia. These vaccines include measles-mumps-rubella (MMR), diphtheria-tetanus-pertussis, varicella (chickenpox), polio, and your yearly flu shot. You are also encouraged to obtain vaccines for hepatitis A, hepatitis B and rabies, as these diseases could be picked up in the country. Slovakia does not pose any great dangers to tourists. You are encouraged to remain cautious as with every new destination that you visit. The country does experience incidences of petty crime, such as pickpocketing and purse snatching. You should not leave food or drinks unattended in nightclubs and bars, as it may be spiked. Always carry some form of identification with you and never show signs of affluence.